Marvel’s Spider-Man PS4 is out now on Sony's leading console, and not only is it the first licensed property for esteemed developer Insomniac Games, but it’s the first Spider-Man title in years to not come from the Activision-owned studio Beenox. Having originally ported several classic Spider-Man titles to PC in the mid 2000’s, the moderately sized Quebec-based team eventually got the chance to create its own take on the webslinger, cultivating a name for itself as “the Spider-Man studio” with games like Shattered Dimensions, Edge of Time, and two licensed tie-ins to The Amazing Spider-Man movies. Though Beenox’s output of Spidey titles was steady between 2010 and 2014, the quality of each was less so, especially in the shadow of Treyarch’s Spider-Man 2, which remains a benchmark for Spider-Man games still to this day. With Peter Parker making his big comeback this month, however, I figured it would be an apt time to chat with Beenox’s co-head Thomas Wilson to look back on the past, present, and future of Spider-Man’s ever changing relationship with interactive entertainment, and the studio’s own history with the character in particular. Shattered Dimensions was Beenox’s first real Spider-Man title, following its successful ports of old games like Ultimate Spider-Man and Spider-Man: Friend or Foe. Praised for its ambitious, fan servicing plot and confident vision, Shattered Dimensions was a very strong start for Beenox, so it’s no surprise that it also happens to be Wilson’s personal favourite too. After the success of Shattered Dimensions, Beenox was in the unfortunate position of attempting to follow up on struck gold with limited resources. Edge of Time took place in two different Spider-Man universes, down from Shattered Dimension’s four, as the Amazing Spider-Man worked with Spider-Man 2099 to stop a powerful foe that threatened them both. Many found Edge of Time to be strangely limited and repetitive compared to the previous game, but Wilson explains that Beenox had been under a lot of pressure. “The big difference with Edge of Time is that we had very little development time, and I guess that's the reason why some of the fans were potentially disappointed that it was half of what Shattered Dimensions had been. It was a situation where a game needed to be released quickly, so the decision was made to focus exclusively on Amazing Spider-Man and Spider-Man 2099, as we knew that it was a storyline that we’d seen in the comic books." 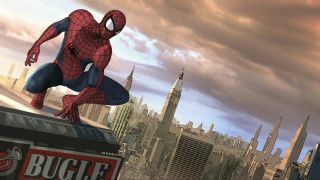 With two original Spidey titles to its name, Beenox was eventually put to work by Activision on a movie tie-in game to The Amazing Spider-Man reboot starring Andrew Garfield. It would mark the first time in a long time that players could get back to liberally swinging around Manhattan as the webhead in a video game, and Wilson welcomed the challenge to return the character to an open-world after his brief stint with linearity. As Garfield’s nascent franchise received a hastily made sequel, so too did Beenox’s movie tie-in series. The Amazing Spider-Man 2 was probably the studio’s least well received Spider-Man game of the four, especially as this was Spidey’s first appearance on current-gen consoles, but looked about as technically proficient as an Xbox 360 launch title. Wilson readily admits that it was not the game he’d hope to have finished Beenox’s journey with Spider-Man on. "I made one of the worst design decisions of my entire career in The Amazing Spider-Man 2!" So, now that the property is off his and Beenox’s hands, what does Wilson make of Insomniac’s Spider-Man game, and of the evolved superhero genre at large? You won’t be too surprised to hear he’s just as full of praise for the studio as everyone else is right now. “I think Insomniac taking over the reins of Spider-Man is great. I’m a huge fan of their games and I’ve been playing them for a long time, so I was watching closely when I found out they were developing it. I haven't had a chance to play it yet, but I’m look forward to trying it out. What I’ve seen so far looks great!" At the moment, Wilson and the rest of Beenox are hard at work helping Treyarch bring Call of Duty: Black Ops 4 to PC, which he calls a “AAA PC title with all the bells and whistles that involves”, but the studio’s co-head promises big things from the studio in the long term. For more vigilante antics, check out our run down of the best superhero movies of all time, and count how many Spideys make the cut.